74 MMS October 2017 mmsonline.com FEATURE not so much achieving size tolerances, but rather tight concentricity tolerances. "It's sometimes more difficult to get a warped part straight than it is to get it to size," Mr. Stahl says. INTERCONNECTING RIGIDITY, CUTTERS AND CUT DATA The two recent turning centers True Die purchased for hard turning are Mazak Quick Turn Nexus 250 II models with 12-station turrets (neither having live-tooling stations). The first of these machines was purchased in April 2016 and the second later that year in August, and they offer the rigidity the shop needed to form the foundation for its hard- turning process, Mr. Stahl says. 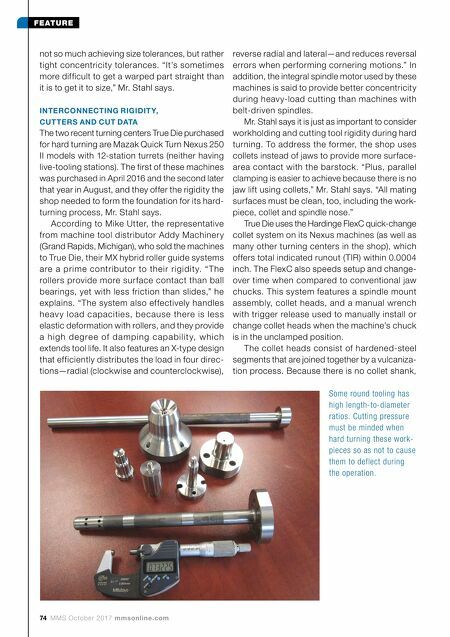 According to Mike Utter, the representative from machine tool distributor Addy Machiner y (Grand Rapids, Michigan), who sold the machines to True Die, their MX hybrid roller guide systems are a prime contributor to their rigidit y. "The rollers provide more sur face contact than ball bearings, yet with less friction than slides," he explains. "The system also effectively handles heav y load capacities, because there is less elastic deformation with rollers, and they provide a hig h d e g re e of d a m p ing c a pa b ili t y, w hic h extends tool life. It also features an X-type design that efficiently distributes the load in four direc- tions—radial (clockwise and counterclockwise), reverse radial and lateral—and reduces reversal errors when performing cornering motions." In addition, the integral spindle motor used by these machines is said to provide better concentricity during heav y-load cutting than machines with belt-driven spindles. 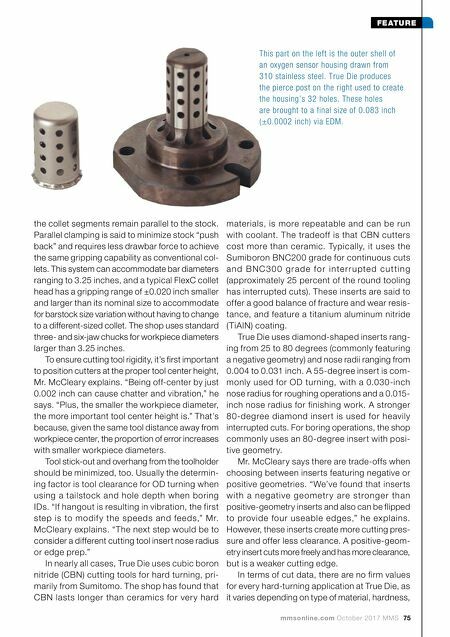 Mr. Stahl says it is just as important to consider workholding and cutting tool rigidity during hard turning. To address the former, the shop uses collets instead of jaws to provide more surface- area contact with the barstock. "Plus, parallel clamping is easier to achieve because there is no jaw lift using collets," Mr. Stahl says. "All mating surfaces must be clean, too, including the work- piece, collet and spindle nose." True Die uses the Hardinge FlexC quick-change collet system on its Nexus machines (as well as many other turning centers in the shop), which offers total indicated runout (TIR) within 0.0004 inch. The FlexC also speeds setup and change- over time when compared to conventional jaw chucks. This system features a spindle mount assembly, collet heads, and a manual wrench with trigger release used to manually install or change collet heads when the machine's chuck is in the unclamped position. The collet heads consist of hardened-steel segments that are joined together by a vulcaniza- tion process. Because there is no collet shank, Some round tooling has high length-to-diameter ratios. Cutting pressure must be minded when hard turning these work- pieces so as not to cause them to deflect during the operation.